As the launch of the Google Pixel 2 and Pixel 2 XL nears, yet another leak has surfaced. This time the standard-size model, codenamed ‘Walleye’, makes an appearance in a series of heavily blurred images – or at least parts of it do..
A source has posted leaked images that show off select chunks of the device’s front and back. One feature we can actually make out that isn’t obscured is the phone's front-facing camera, which looks to be in a similar location to last year’s Google Pixel. The new leak shows off one of the Google Pixel 2's two front-facing speakers in the photo, a design reminiscent of the Google Nexus 6P. Looking at the back on the phone, the fingerprint sensor pokes through the blur, showcasing a grey color flanked by what looks to be black aluminum. Up top, the camera is in a familiar location to today’s Pixel devices: offset to the right and stuck next to a flash on its left. The big difference here is the sheer size of the sensor. It’s quite a bit larger, to the point that it’s protruding from the chassis and looks to mirror the overall shape of the fingerprint sensor. That, and the array of various sensors is now located beneath the flash. According to this source, which 9to5Google claims is reputable, both the Google Pixel 2 and Pixel 2 XL (codenamed Taimen) will ship with IP68 waterproofing, a highly desired feature that’s been mulled over in the rumor mill for some time. One bit of disappointing news is that this source has also confirmed that both models will skip the 3.5mm headphone jack. Interestingly, they state that Google is currently devising “damage control” ideas as to how it can manage the inevitable fury of port purists when the Pixel 2 is announceed. It’s possible that it might do this by including the rumored Google Assistant headphones in the box, or maybe it'll double down on its commitment to high-quality wireless audio codecs – one of the big benefits coming with Android Oreo. 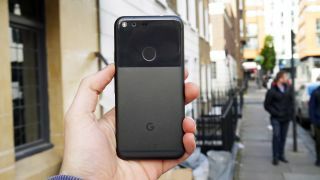 Each leak pieces the new Google Pixel 2 together a little more, and if the rumored October 5 launch date is true, we don’t have all that long to wait before we see these highly anticipated phones.